Mother’s Day is over-rated. Sorry Hallmark, that’s just the way I feel. Too many Mother’s Day’s with expectations set too high. A few years ago I started making my own favorite spinach quiche the Saturday prior so my loved ones had nothing to do but throw it in the oven. As good as that tasted, it still felt empty. My kids this year, now 6 and 8, have been busy working on homemade cards and gifts this week at school. I am more rested and more realistic about the day. So much so that I get a jump on it – I’m taking this Saturday as the day. Anything splendid that happens on Sunday is a complete bonus. As it turns out, this Mother’s Day Eve is one to replicate – minus the four loads of laundry I did from 7-10a.m. 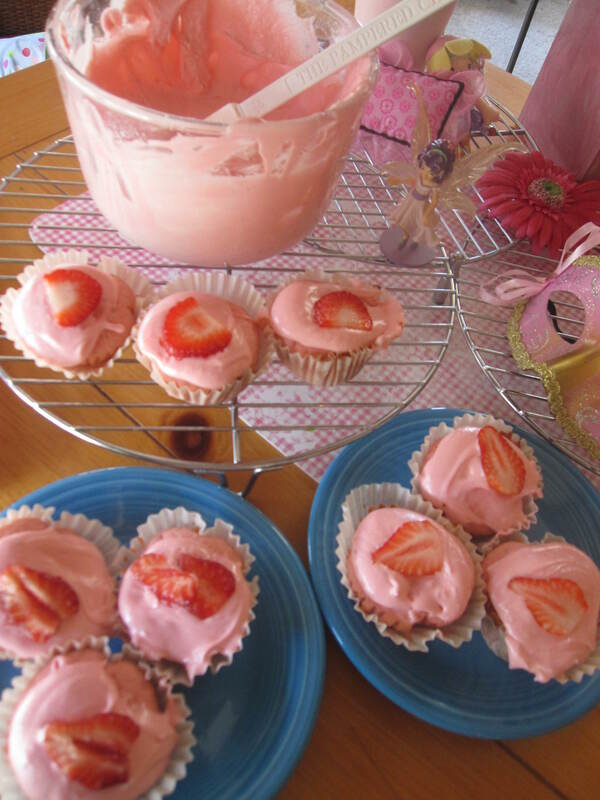 It began at 10:05, when I enlisted my kids to join me in a stress-free, relaxing day. 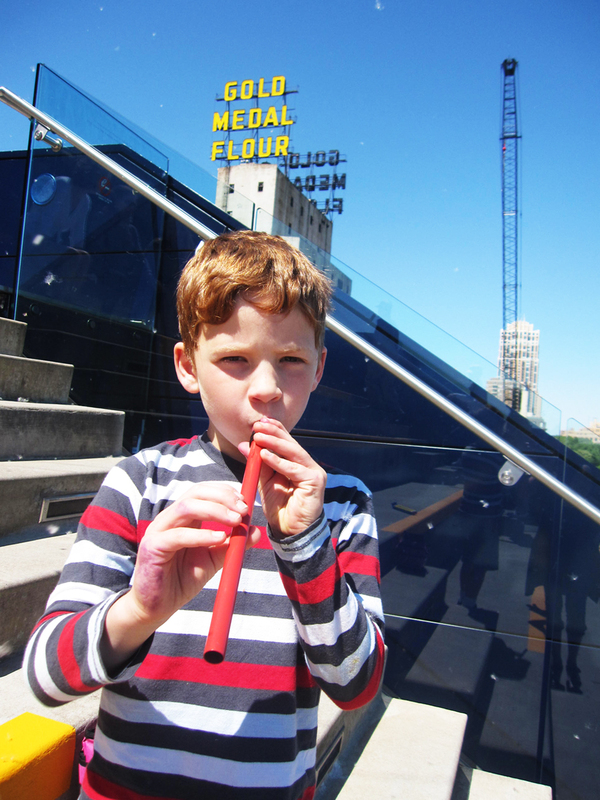 We arrived at Mill City Farmer’s Market around 10:45a.m. I actually did not mind milling about for a parking spot for 15 minutes – a lesson in patience for the kids. Once parked, they circumvented the Mill Ruins Park circular hill walk-way with a straight-up route and rolled down a few times before I made my way up to the top on the legitimate path. Hunger was beginning to set in. We were in search of abelskievers, but landed on Italian coffee (for me) and Gluten-free pound cake for the kids. A live band played in the background. A bride had her photo taken against a dramatic red backdrop near SeaChange, a restaurant at the Guthrie. People found sunshine and a place to take in their Chef Shack snack on the steps leading down to the river. Kudos to the Guthrie. There is no stuffiness or pretense. Any joe public can meander in and move about the building. We entered and started with the gift shop. 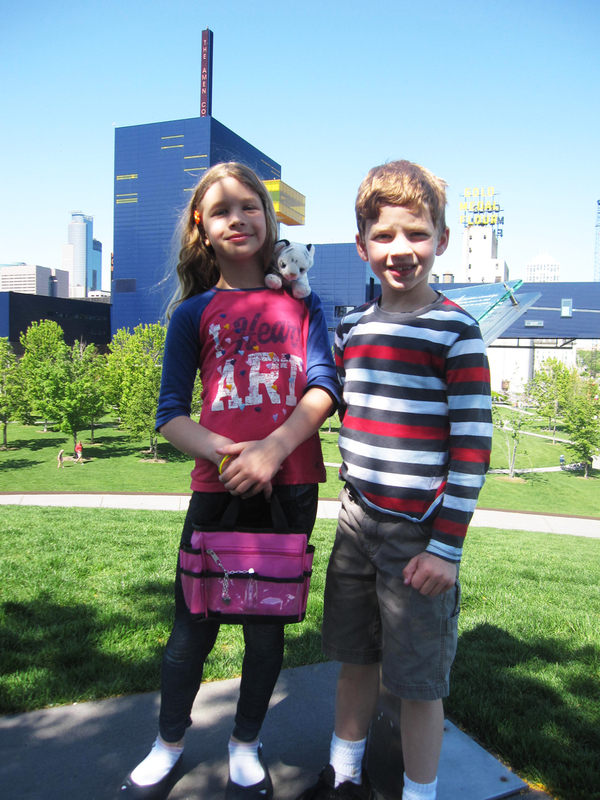 Both kids decided how to spend all or a portion of the $20 they brought that day. Calvin bought a $5 recorder/flute. Ava opted to spend nothing, although I purchased a birthday gift for her friend whose party she’d attend later that day. We took the elevator to the fifth floor and walked out on the Endless Bridge. Calvin happily played his new toy. Others agreed when I suggested to him that he tone it down. Ava sought out places beyond the Stone Arch that she wanted to explore. Not today, I told her. We took the four-floor escalator down then hopped in our car to our next destination: Wise Acre Eatery. I had a hunch it might be a bit of a wait. I set the kids’ expectations accordingly. Sure enough, it was 30 minutes. Tangletown Gardens, just next door, was the perfect distraction. I had done drive-bys, but had never stopped in. The shop, bursting with creativity and pushing the full garden ambiance, featured plants and flowers among decorative and practical garden display vignettes. 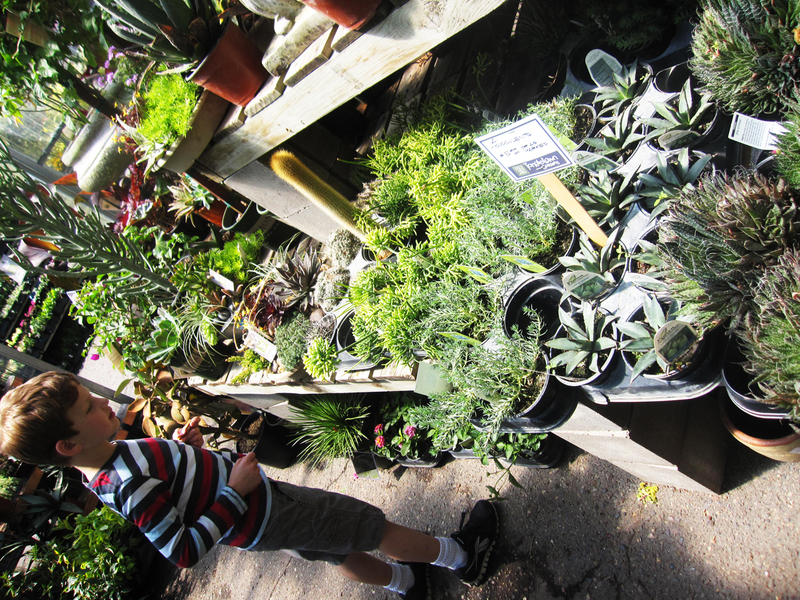 We wound through walkways and stumbled into the greenhouse, which Calvin thought to be fascinating. Cactuses and arid climate arrangements in rock gardens caught his eye. Ava was more fixated on the birds and other garden sculpture displays. It effectively staved off the hunger and got me thinking about gardening, which, since the summer of 2010, had been hard to do. Beep beep. Almost 12:30 and time to grab our patio table at Wise Acre. The vibe at the acres is so mellow. I could stay here for hours. We nearly do. There is no kids’ menu. They split the Back to Bed Baked French Toast which comes with yogurt, granola and berries and I go for the fried egg, cheddar and ham on a brioche with ground mustard over a side of greens. 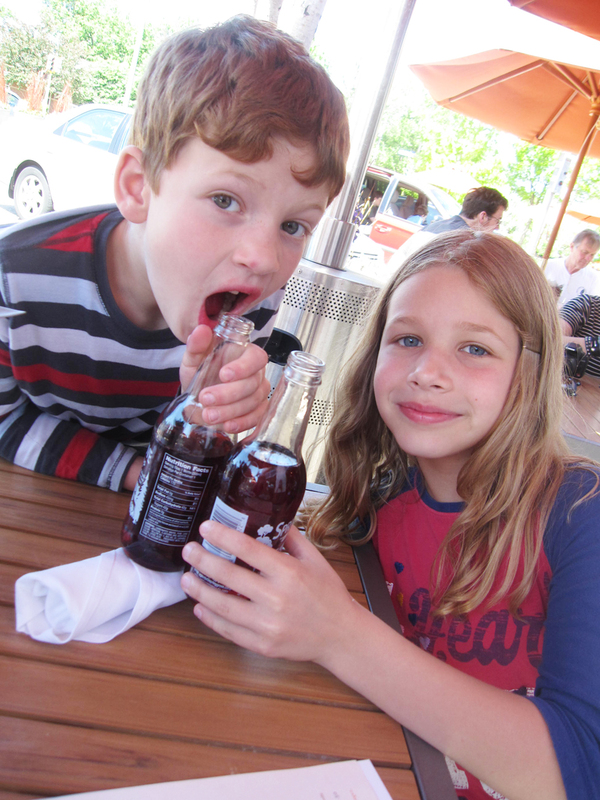 The kids are full of carbonation after their $3 black cherry sodas. Calvin has a $2 bill and a one weighted down under his glass for another in anticipation. That never comes to fruition, but Ava brings her empty bottle home as a souvenier. The service is good, but nonchalant. Harley riders come and go. Fire Station #27 across the street sees some action. Avid gardeners wheel their plantings for the season away from Tangletown. It’s time to call it. We’re pushing a 3-hour outing, which doubles our optimal outing time from just two years ago when they were 4 and 6. I have always sought out from others and thought about recommending comprehensive, realistic suggestions for an outing with kids. 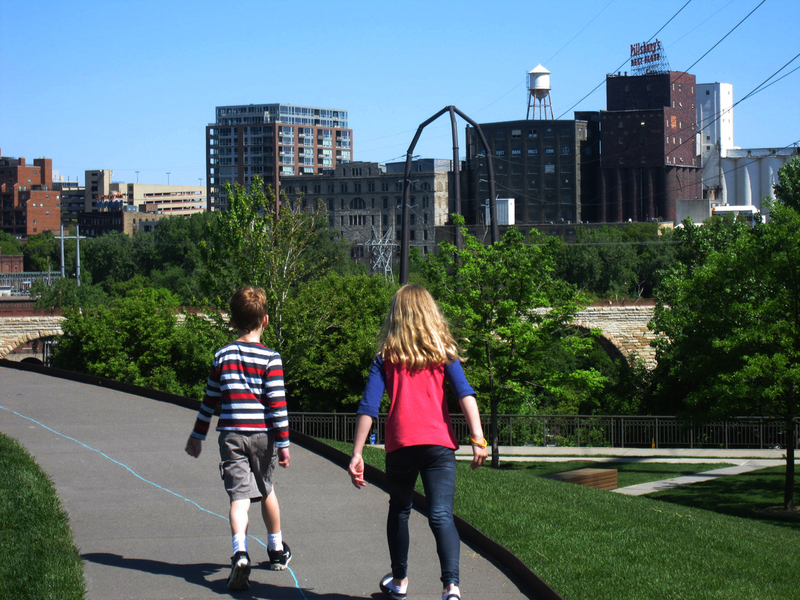 This route – from Mill Ruins Park to Mill City Farmer’s Market to The Guthrie to Wise Acre Eatery and Tangletown Gardens – kept the kids questioning and me exploring. I would highly recommend the venture to all Mom’s out there – Mother’s Weekend, or not.